The genesis for a publicly funded institution of higher education in Huntsville was years in the making. Beginning in January 1950 as an extension of the University of Alabama and known as the University of Alabama Huntsville Center, classes were first taught at West Huntsville High School. However, the university's direction changed in 1961, when Wernher von Braun, a German rocket scientist brought to the United States under Operation Paperclip after working for the Nazi regime, helped create a research institute to provide advanced engineering and science curricula to NASA scientists and engineers. Even though Huntsville had been home to Alabama Agricultural and Mechanical College since 1875, and Oakwood University since 1896, this was still the era of segregation. UAH's first undergraduate degrees were awarded in May 1968 as part of the spring commencement ceremony at The University of Alabama, Tuscaloosa, (although a "cap and gown" ceremony was held in Huntsville). One year later, the University of Alabama System Board of Trustees voted to make UAH an independent and autonomous campus. Dr. Benjamin Graves, a graduate of the University of Mississippi in 1942, who was president of Millsaps College in Jackson, Mississippi was tapped as UAH's first president in 1970. He returned to faculty status in 1979 and retired in 1989. The first degree awarded for work completed entirely on the UAH campus was awarded to Julian Palmore in 1964. Mr. Palmore was at the time a United States Navy ensign assigned to NASA's Research Projects Division. The first official on-campus graduation ceremony at UAH was in June 1970. The first woman to earn a PhD from UAH was Virginia Kobler in 1979, in Industrial Engineering. UAH's second president, Dr. John Wright, was Vice Chancellor of the West Virginia University and began his service in 1979. Wright's term ended in 1988 and Dr. Louis Padulo, former Stanford professor and dean of engineering of Boston University, became UAH's third president. Huntsville leader Joseph Moquin took over the UAH presidency on an interim basis in 1990. Dr. Frank Franz, who was then provost at West Virginia University, was chosen as UAH's fourth president. His wife, Dr. Judy Franz, accompanied him and was granted full professorship in the physics faculty. Her renown in the scientific community was reaffirmed when she was named executive officer of the American Physical Society in 1994. At the beginning of the 2006–2007 academic year, Frank Franz announced his plan to step down as president after that year. On July 1, 2007, Dr. David B. Williams, formerly a professor of materials science and engineering and the vice provost for research at Lehigh University, began serving as UAH's fifth president. He left in 2011 to join Ohio State University as dean of engineering. Robert Altenkirch was hired as the university's sixth president in September 2011. Dr. Altenkirch served as president of the New Jersey Institute of Technology for nine years before joining UAH. UAH offers 89 degree-granting programs, including 44 bachelor's degree programs, 30 masters' degree programs, and 15 PhD programs through its nine colleges: Business; Engineering; Education; Arts, Humanities, & Social Sciences; Nursing; Science; Graduate Studies; Honors; and Professional & Continuing Studies. Nursing is UAH's largest single major, although Engineering is the largest college. There is also an Honors College which offers an enriched academic and community experience for undergraduates in all disciplines. Not surprisingly given Huntsville's technology-based economy, UAH is known for engineering and science programs, including astrophysics, atmospheric science and aerospace engineering. UAH scientists managed the first "commercial," non-government rocket programs (Consort and Joust) in the U.S., the first "high-temperature" superconductor was discovered at UAH and the first U.S. experiment flown aboard the Soviet Mir space station was from UAH. UAH is a Space Grant university, and has a history of cooperation with NASA at the Marshall Space Flight Center, and the U.S. Army Aviation and Missile Command at Redstone Arsenal. In conjunction with helping NASA reach its goals, UAH makes NASA's research and technology available to all of Alabama's colleges and universities. The National Space Science and Technology Center is on the UAH campus. The UAH Propulsion Research Center ([PRC]) is a research center that promotes interdisciplinary research opportunities for graduate and undergraduate students. The PRC was founded by Dr. Clark W. Hawk in 1991 and has since provided support for NASA, the Department of Defense, and the Department of Energy. Research topics explored include air-breathing propulsion, solid, liquid & hybrid propellent combustion, magnetoinertial fusion, electric propulsion, high temperature materials, and space and terrestrial power systems. Research in nanotechnology and microfabrication is administered by the Nano and Micro Devices Center. Atmospheric Sciences and related research is headquartered in the NSSTC and SWIRLL buildings, both of which are on campus. At least nine departments or programs also hold accreditation from professional associations, including the Accreditation Board for Engineering and Technology, the American Assembly of Collegiate Schools of Business, the American Chemical Society, the Commission on Collegiate Nursing Education, the Computing Sciences Accreditation Board, The National Association of Schools of Art and Design, and the National Association of Schools of Music. U.S. News & World Report ranks UAHuntsville as a Tier 2 national university. In 2011, the Carnegie Foundation classified UAH as "very high" in the research category, making it one of an elite group of 73 U.S. public universities. The UAH 2015 freshman class's ACT score averaged 27.2, highest among Alabama's public universities. USA Today and Princeton Review ranked UAH as one of the top 50 educational values in the U.S. Compared with similar-sized public universities (~7500 students), UAH ranks first in research expenditure in the nation (over $97 million). UAH usually partners with surrounding government agencies, like NASA, the U.S. Army, and other Department of Defense agencies and their associated contractors. In the 2014 National Science Foundation federal research fundings rankings, UAH had five programs ranked in the top 20 in the nation. The top programs were No. 5 in federally funded R&D in aeronautical/astronautical engineering; No. 11 in federally funded atmospheric science; 12th in federally funded computer sciences; No. 16 in business and management research; and No. 17 in astronomy. UAH ranks 13th in the nation in NASA-sponsored research and 19th in DoD research. UAH sponsors nine men's and nine women's varsity athletics programs. In 2016, UAH added men's and women's lacrosse to its varsity athletic programs. UAH is a member of the National Collegiate Athletics Association (NCAA), competing in Division II in 18 sports including men's ice hockey. UAH is a member of the Gulf South Conference in all sports except hockey, which plays in the Western Collegiate Hockey Association. The UAH Student Government Association is the primary recipient of student activity funding with the Space Hardware Club (A College of Engineering registered student organization second to it. All student organizations, with the exception of ACE Across Campus Entertainment must be chartered with UAH's Student Life Department. The SGA hosts a number of events including Week of Welcome, an annual event that welcomes incoming freshmen the weekend they arrive on campus through the first week of the semester. The SGA holds an advisory role with campus administrators on activities involving students. UAH has six residence halls: Central Campus Residence Hall (CCRH), Frank Franz Hall, North Campus Residence Hall (NCRH), Southeast Campus Housing (SECH), Charger Village - Original (CVO) and Charger Village - Addition (CVA). Central Campus is reserved for first-time freshmen. Frank Franz Hall is reserved for first time students as well as Honors College students. Charger Village-Original (CVO) is reserved for sophomores, whereas upper class students have the option of living at the other residence halls. Campus Housing originated with the construction of Southeast Campus Housing. These suites were originally built by the late Dr. Benjamin Graves, the first President of UAH, with the assistance of the late Alabama Senator John Sparkman. UAH is home to the following fraternities and sororities. Most Greek organizations rent a fraternity or sorority house from the university. Each of these houses was constructed in 2006, made possible by donations from Mark and Linda Smith and Jim and Susie Hudson. The Association for Campus Entertainment (ACE) is a student run and operated organization that hosts weekly events throughout the school year, as well as standing programs such as Tasty Tuesday, Friday Night Flicks and CU Sounds. Notable guests include Daniel Tosh and Recycled Percussion. UAH has more than 170 student-run organizations on campus. Team UAH is internationally renowned for its award-winning concrete canoe construction competition team, and is the current record holder with five national titles in 1993, 1994, 1996, 1998, and 2001. The National Concrete Canoe Competition is sponsored annually by the American Society of Civil Engineers. The UAH ASME (American Society of Mechanical Engineers) also competes in the annual NASA Human Exploration Rover Challenge. The UAH ASME chapter holds two championship titles. The UAH Space Hardware Club is a volunteer student run club that conceptualizes, designs, builds, tests, and flies hardware for high altitude balloons, satellites in space (ChargerSat Program), the CanSat competition, and high-powered rocketry. Members must maintain a GPA of 3.0 on their college transcript. The Student Success Center (SSC) offers tutoring for nearly all freshman and sophomore level courses offered at UAH. Additional tutoring is available for math courses online and in person. The SSC recruits university students for its PASS (Peer Assisted Study Sessions) program, in which students sit in on courses that they have already succeeded in, and offer class-specific study sessions outside of class, usually 3 hours per week. Historically difficult freshman courses are targeted for PASS, including Calculus, Chemistry, and Economics. Recently, the SSC has absorbed the Cooperative Education program. The Japanese Supplementary School in Huntsville (ハンツビル日本語補習校 Hantsubiru Nihongo Hoshū Jugyō Kō), a Japanese supplementary weekend school, holds its classes in Morton Hall, with a presence[which?] in the Business Administration Building. It opened in 1983 (Shōwa 58). ^ a b c Laney, Monique (2015). German Rocketeers in the Heart of Dixie: Making Sense of the Nazi Past During the Civil Rights Era. New Haven and London: Yale University Press. p. 138. ISBN 978-0-300-19803-4. ^ "University of Alabama--Huntsville". Retrieved June 28, 2015. ^ "UAH - News". Retrieved June 28, 2015. ^ "UAH - News". The University of Alabama in Huntsville. Retrieved June 28, 2015. ^ "UAH - Academic Affairs - Office of Institutional Research - Common Data Sets". The University of Alabama in Huntsville. Retrieved June 28, 2015. ^ "2014 National Universities Rankings". Washington Monthly. n.d. Archived from the original on August 28, 2014. Retrieved May 28, 2015. ^ "UAH - College of Science - Departments & Programs - Computer Science". The University of Alabama in Huntsville. Archived from the original on June 28, 2012. Retrieved June 28, 2015. ^ ASCE. "Alabama Concrete Canoe - Team UAH". Uah.edu. Retrieved July 17, 2015. ^ "Space Hardware Club". Space.uah.edu. Retrieved July 17, 2015. ^ "北米の補習授業校一覧（平成25年4月15日現在）." (Archive) MEXT. Retrieved on May 5, 2014. "The University of Alabama in Huntsville (UAH内) Morton Hall Ben Graves Drive Huntsville,AL 35899"
^ "shisetsulist.html." (Archive). Consulate-General of Japan in Atlanta. Retrieved on May 11, 2014. "UAH Busuness [sic] Administration Building 301 Sparkman Dr NW Huntsville, AL35899"
^ "学校概要" (Archive). Japanese Supplementary School in Huntsville. Retrieved on May 11, 2014. "学校所在地 : The University of Alabama in Huntsville (UAH) Ben Graves Drive Huntsville, AL 35899"
^ "Werner Dahm - Michigan Engineering". Retrieved June 28, 2015. ^ "Astronaut Biography: Nancy Davis". Retrieved August 1, 2010. ^ "John Hendricks: An Oral History," The Cable Center, September 2, 2003. ^ Clines, Keith (July 16, 1995). "Hettinger city's mayor since '88". The Huntsville Times. pp. S11, S59. ^ "Scott Munroe hockey statistics & profile". Hockey DB. Retrieved August 1, 2010. ^ xxyy013. "Cindy Wright". Retrieved June 28, 2015. ^ "Alabama Authors and Their Works: 20th century and Beyond". Archived from the original on July 16, 2011. Retrieved August 1, 2010. ^ "About Doc Travis". Archived from the original on June 16, 2010. Retrieved August 1, 2010. 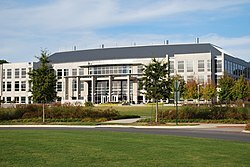 Wikimedia Commons has media related to University of Alabama in Huntsville.